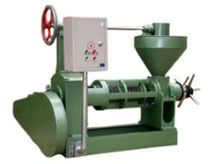 This oil expeller press features a smooth shell, it is easy to operate and repair, has a wide range of applications, performs reliably, and is capable of processing rapeseed, cottonseed, sesame, peanuts, soybeans, sunflowers, jatropha, linseed and other oil plants. The Model YZS-100 oil press is the best choice for small and medium-sized oil extrusion workshops or individual households. Spare parts are always supplied. Customers are typically very satisfied with this oil seed press. The YZS-100 oil expeller press can also be matched with diesel engine. 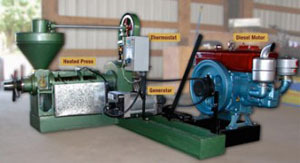 The following picture shows the combined oil seed press, thermostat, generator and diesel engine. This combined oil expeller press is used by many customers. The diesel offer the power for the generator, then the generator can offer the electricity for the control cabinet and heating pipe in the oil seed press. The YZS series oil expeller presses are in accordance with the standard JB/T9793.1-1999 in China. Their quality are also authorized by CE certificate and ISO9000. The durable performance and reasonable design of our press expeller also accepted by all of our customers all the world. We have much long term cooperaiton with our clients for many years.